Pattern Formations is a synthesis between the inherent beauty of natural systems and the geological structures and minerals of the Wasatch Front. The project is located throughout the new Tracy Hall Science Center at Weber State University in Ogden, Utah and was commissioned by the Utah Department of Heritage and Arts, Division of Arts & Museums. The centerpiece of Pattern Formations can be found in the atrium at the heart of Tracy Hall. The 40 foot tall sculpted wall with a central runnel of water references the nearby geological formation known as the Devil’s Slide, a horizontal limestone formation tilted 90 degrees approximately 75 million years ago and carved out by water and erosion ever since. 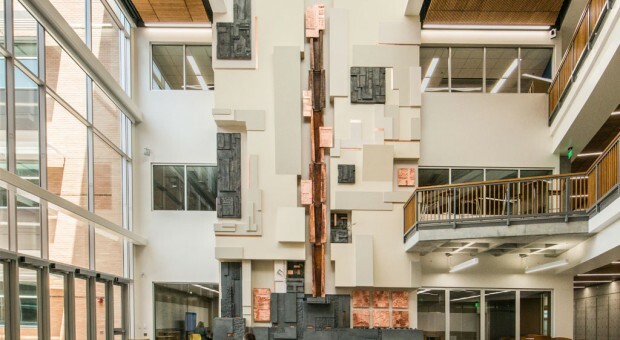 The central crevice of the wall enfolds a sculpted copper dipped aluminum runnel that will patina over time creating a further reference to the vegetated washes found in the ravines and canyons above the Weber State University Campus. Small planters placed along the crevice reinforce this delicate relationship between water and life. The slow trickle of water in the runnel alludes to the scarcity and value of water in the region. At the bottom of the runnel the water flows into a basin creating a subtle sound of falling water amplified by the atrium space. The water is intermittent, intended to cease flowing during dry periods when no rain or snow melt has been present for a span of time. The flow of water, copper detailing, and patterned niches throughout the wall will change as the sunlight in the atrium shifts in direction, angle, and intensity over the course of the day and the year. The geometries found in the work as a whole relate to the crystalline formations of salt found nearby in the Great Salt Lake to the west and in the Twin Creek Limestone formations to the east. Patterned concrete flooring with exposed aggregate and copper insets merges with the base of the atrium wall, creating an interrelationship between the ground and the wall to complete the atrium space. The project incorporates six distinct Pattern Formations which are integrated with the atrium space and throughout the Tracy Hall Science Center; these unique pieces are also the project’s namesake. The Pattern Formations are abstractions based on natural patterns, observed phenomena, systems, materials, and structures that reference the scientific disciplines found within the building. The six patterns are Fractal, Concentra, Linear / Rectilinear, Branching, Hexagonal, and Spiral. The patterns in the work are derived from botany, chemistry, geosciences, mathematics, microbiology, physics, and zoology; representing the departments housed within Tracy Hall. Some of these patterns relate to multiple disciplines – such as logarithmic spirals which have references in mathematics, botany, zoology, and physics. The synthesis of these patterns is intended to inspire curiosity, provoke conversations beyond one’s own scientific discipline, and reveal possible connections between the sciences. These complex and evocative patterns are abstracted by the artist in relief form and then cast into aluminum which is then copper dipped. The use of copper throughout the project is a reference to the abundance of this element found in the region, which is also the State Mineral of Utah.